Power lift with power-opening base. 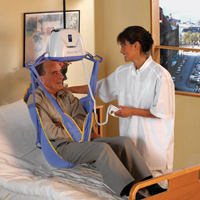 An ideal product for everyday patient handling, ensuring caregiver security and patient peace of mind during the transfer. A versatile solution to many general lifting problems. 350lb. 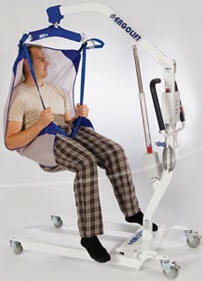 capacity electric patient lift. Description: A freestanding, versatile solution for all types of point-to-point transfers - wheelchair to bed, bed to chair, even in the bathroom, anywhere there is a lift and transfer need. Description: With its ergonomic shape, easy maneuvering capability and outstanding features the Ergolift-II is the perfect floor lift equipment to use at home. 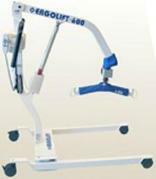 Description: The Ergolift 600handles patients up to 600 lb (272kg). Plus its wide opening base allows easy access to wider bariatric chairs. Description: The Junior foldable lift handles all conventional lifting situations then compacts for storage under the bed or behind a door. Description: Designed to meet the needs of the caregiver as well as the patient, the HPL402 features ergonomic handle grips to reduce back strain and a mechanical down-release lever for non-powered lowering. 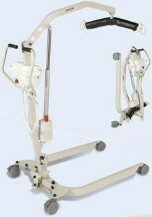 The single-speed actuator is reverse-mounted to give the patient increased leg clearance. 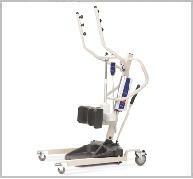 Description: The Advance patient lift from Hoyer represents a true step forward in patient lift design and performance. 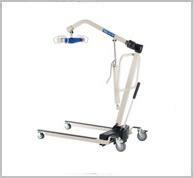 Description: Constructed with patient comfort in mind, the HML400 features an angular design with a non-sway cradle for extra stability. 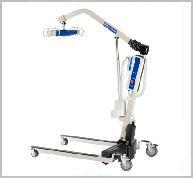 Full travel height range allows lifting from the floor, and the easy-to-adjust base legs lock securely into position. The 6-point cradle accommodates Hoyer® 4-point Slings and Traditional Slings, and the unit disassembles for easy storage. 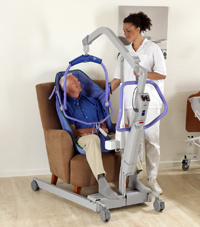 Description: Invacare Reliant lifts support up to 450 lbs., making potentially challenging transfers smooth for the resident and the caregiver. 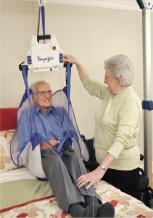 The high lift range allows easy access to tubs, chairs, commodes, floors and beds. 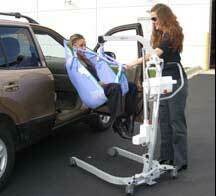 Description: BHM Medical's 12-pound portable track lift, the Voyager, is a David in a world of Goliaths. Not only is it easy to carry and store, but with a lifting capacity of some 440 pounds, it is in a performance class by itself. 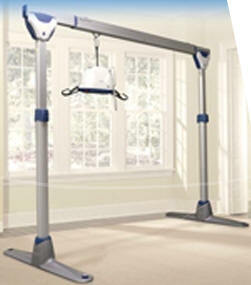 Description: An easy-to-operate portable ceiling lift system that combines the key features of a fixed system with the benefits of maximum flexibility.